Take a walk down memory lane and let your thoughts turn to yesteryear. New designs feature old-time treasures, styled with color and charm. 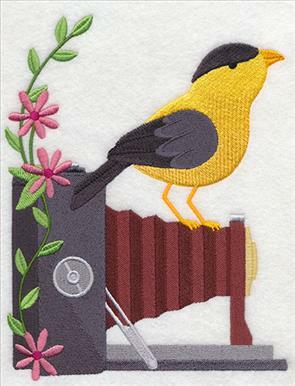 Birds and butterflies perch on an antique camera, telephone, and a Victrola. A set of nine is just right for quilts and wall hangings. 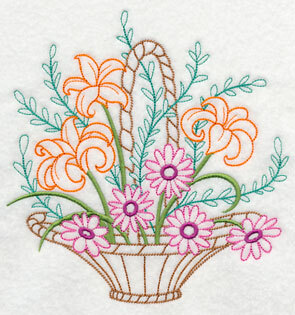 Intricately detailed flower cameos let your creativity blossom on tote bags and cushion covers. 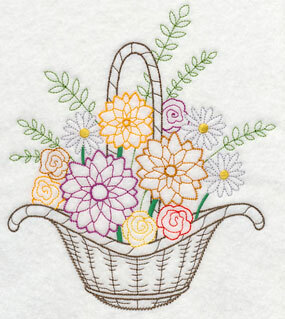 Vintage-style flowers bloom from baskets, and are accompanied by delicate and colorful borders. 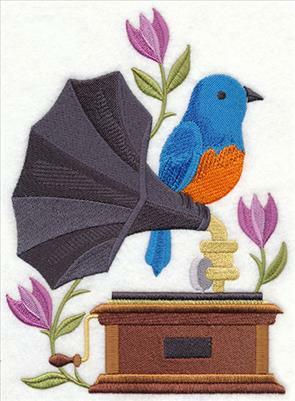 These designs are light and lively on tea towels and pillowcases. 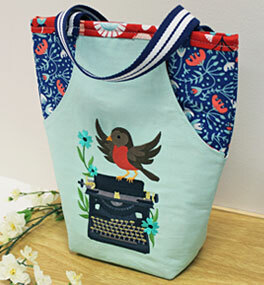 Fashionable curved outer pockets bring unique style to this tote bag, leaving plenty of room to display charming embroidery. Click here for free project instructions! 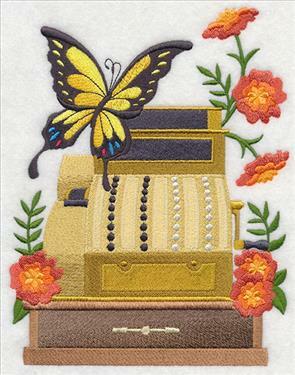 Step right into the embroidery antique shop and feast your eyes on these treasures! Photographers will love the antique camera design on jackets and bags. 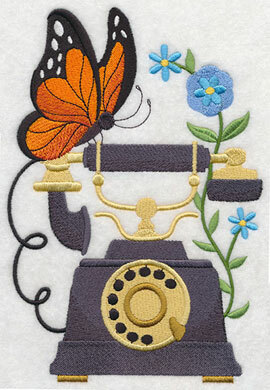 And, the little butterfly perfectly perched on the phone is colorful and sweet on tea towels and pillows. 5.37" x 7.81" and 4.72" x 6.85" and 2.66" x 3.85"
Music lovers will delight in this antique Victrola. All creatures great and small - like this little bird! - are drawn to the sound of music. An antique pitcher and bowl set are a lovely addition to bath towels. 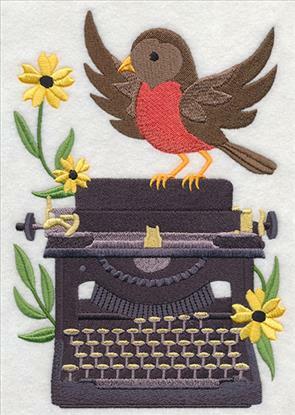 5.22" x 7.79" and 4.61" x 6.87" and 2.58" x 3.85"
Writers, readers, and lovers of literature will adore the typewriter on tote bags and pillow covers. It's perfectly paired with a coffee grinder! 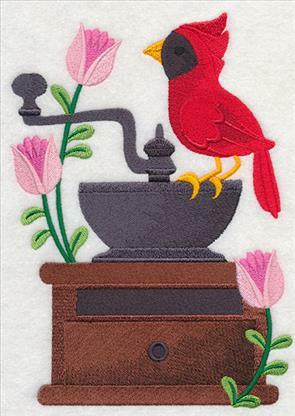 Add to tea towels, mug rugs, and place mats to perk up your home decor. 5.64" x 7.80" and 4.85" x 6.72" and 2.79" x 3.86"
Walk into any antique shop and you'll likely see old-time cash registers and roller skates. 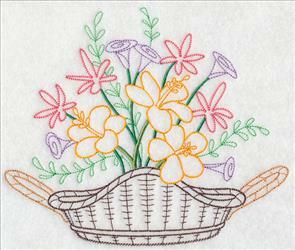 Add these classic elements, bright with color, to quilts, pillow covers, and tote bags. 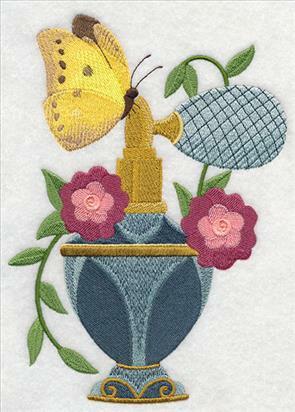 5.55" x 7.80" and 4.85" x 6.82" and 2.77" x 3.89"
Colorful perfume bottles are stunning when stitched on bath towels, tea towels, and pillow covers. Make mini-quilts to display in the bedroom and the bath, too! 5.56" x 7.80" and 4.82" x 6.77" and 2.76" x 3.88"
Bring a classic, nostalgic look to your home decor with these designs! 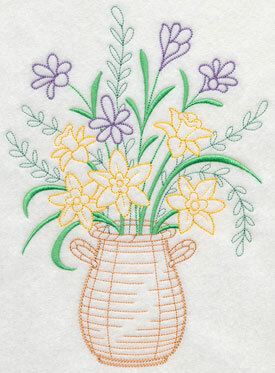 Use them to dress up tote bags, or add the set of nine to quilts, wall hangings, and pillows. Order the designs singly by using the links above, or get all nine in a design pack. Nostalgia blooms and grows in these designs! 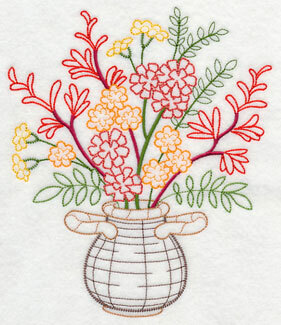 They're inspired by grandmother's hand-embroidered tea towels and bed linens. 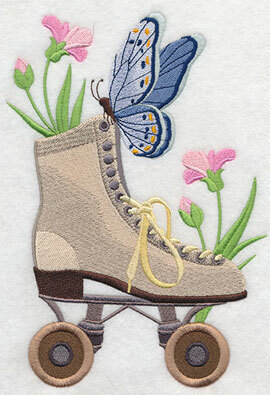 Drawn and digitized in a vintage style, these designs are light and open. 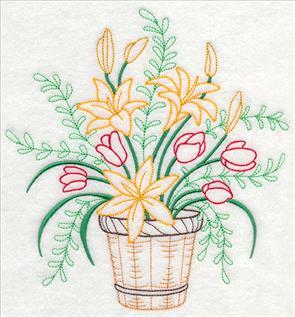 They are wonderful on smooth fabrics, like quilter's cotton, tea towels, and pillowcases. 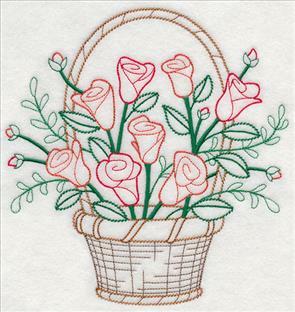 January's basket is filled with edelweiss and snowdrops, while February's basket blooms with loving roses. 6.42" x 7.83" and 5.86" x 7.15"
6.91" x 7.20" and 5.86" x 6.12"
4.86" x 5.08" and 3.70" x 3.89"
Baskets for March and April feature spring bloomers, like daffodils, crocuses, tulips, and lilies. These designs are light and open, and they're lovely on bed linens, tea towels, and quilter's cotton. 6.85" x 9.35" and 5.73" x 7.82"
6.85" x 7.19" and 5.85" x 6.15"
4.85" x 5.10" and 3.68" x 3.86"
May and June baskets are filled to the brim with pansies, lilacs, daylilies, and gerbera daisies. 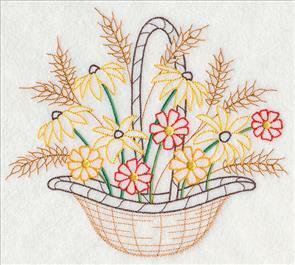 Vintage-style designs are light and quick to stitch. 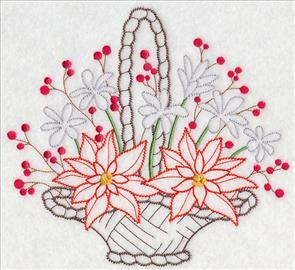 The stitch types are reminiscent of hand embroidery work, but you get the speed and precision of your embroidery machine. These baskets showcase summer's bright colors, and they'll be glorious on table linens, aprons, and pillowcases. 6.85" x 7.80" and 5.85" x 6.67"
6.90" x 7.15" and 5.85" x 6.07"
4.83" x 5.02" and 3.73" x 3.88"
The graceful compositions in July and August baskets are eye-catching on pillows, wall hangings, and tote bags. The designs are light and airy, so they are a perfect match for smooth fabrics - such as linen, quilter's cotton, and flour sack towels. 7.83" x 6.65" and 6.92" x 5.88"
6.85" x 7.68" and 5.85" x 6.57"
4.84" x 5.44" and 3.45" x 3.85"
September flower basket includes sunflowers, asters, daisies, while October flower basket is blooming full of marigolds, chrysanthemums, and crocosmia. They celebrate the transition from summer to early autumn with rich and vibrant colors. 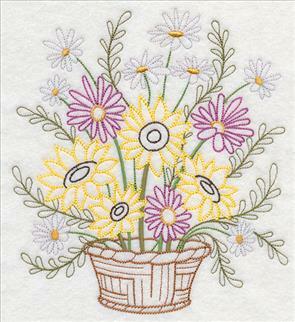 Add these designs to tea towels, aprons, pillows, and wall quilts to celebrate the months and seasons. 6.88" x 7.51" and 5.85" x 6.39"
6.68" x 7.83" and 5.86" x 6.87"
4.86" x 5.70" and 3.29" x 3.86"
November and December flowers are stunning additions to mini-quilts, placemats, and table runners. 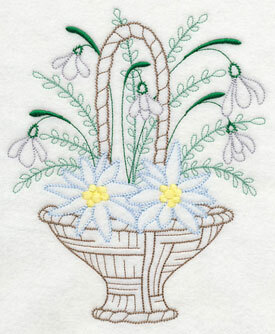 Stitch the months and seasons with these designs, and celebrate the long tradition of embroidery. 7.79" x 6.90" and 6.64" x 5.88"
7.42" x 6.90" and 6.33" x 5.89"
5.24" x 4.89" and 3.85" x 3.62"
Along with the beautiful baskets shown above, there are coordinating borders, too! 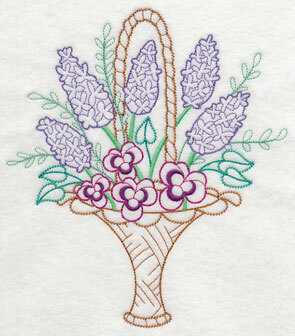 Fill the space on a table runner or pillowcase by embroidering the basket, and a border on either side. 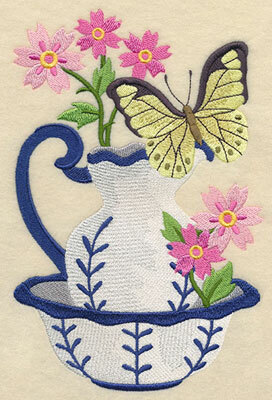 Or, embroider the borders on a set of 12 tea towels, and make a coordinating wall hanging with the baskets! Mix-and-match them to use in a variety of projects. 11.75" x 4.73" and 9.40" x 3.79"
7.83" x 3.16" and 6.00" x 2.66"
7.83" x 2.85" and 6.00" x 2.37"
7.83" x 3.09" and 6.00" x 2.65"
11.74" x 4.98" and 9.39" x 3.98"
7.83" x 3.32" and 6.00" x 2.78"
11.74" x 4.78" and 9.41" x 3.83"
7.83" x 3.19" and 6.00" x 2.72"
11.75" x 4.72" and 9.41" x 3.78"
7.83" x 3.14" and 6.00" x 2.67"
7.83" x 3.07" and 6.00" x 2.63"
7.83" x 3.12" and 6.00" x 2.60"
11.75" x 4.84" and 9.41" x 3.87"
7.83" x 3.22" and 6.00" x 2.66"
11.75" x 4.66" and 9.41" x 3.74"
7.81" x 3.10" and 6.00" x 2.58"
7.83" x 3.09" and 6.00" x 2.63"
11.75" x 4.76" and 9.42" x 3.81"
7.82" x 3.16" and 6.00" x 2.67"
Let your creativity bloom and grow year-round with these designs! They're light and breezy, and classic additions to tea towels, bed linens, and more. Order the designs singly by using the links above, or buy them in a pack! **XXL - 48 designs smaller than 7" x 11.8"
**XL - 48 designs smaller than 7.9" x 7.9"
**Lg - 48 designs smaller than 6" x 10"
**Md - 36 designs smaller than 5" x 7"
**Sm - 24 designs smaller than 4" x 4"
In Victorian times, great meaning was given to flowers. They were almost like a secret language, and there was much custom and etiquette involved in choosing the right flower for a special occasion. Flowers were used on everything - jewelry, clothing, china, calling cards - and the type of flower used sent a significant message. Red roses meant love, respect, and beauty, and that meaning still lingers in the blooms today. 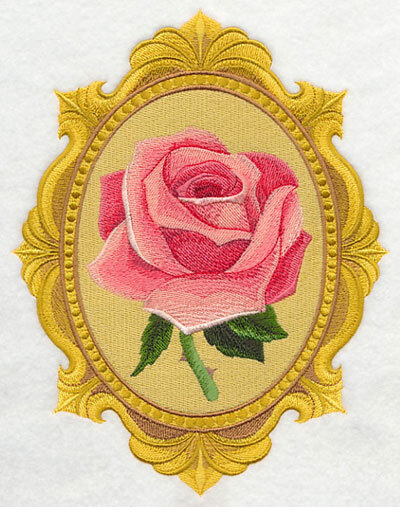 This design features a rose in an elegant, ornate frame. 6.88" x 8.78" and 5.85" x 7.46" and 4.85" x 6.20"
Floriography, or "flower language," was a way to express thoughts and feelings that couldn't be spoken aloud. 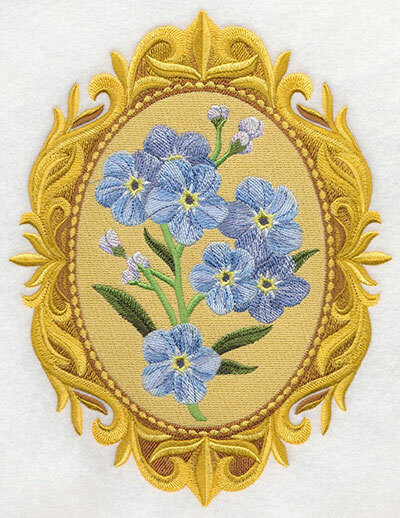 Forget-me-nots given to a lady were a promise from a suitor. They symbolized true love, as well as memories. 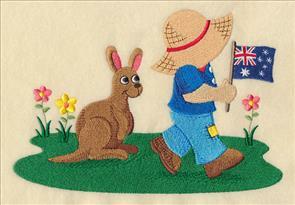 Maria from the UK has many family and friends in Australia, and she wanted to make them something extra-special for Australia Day. It's held on Jan. 26, and commemorates the arrival of the first fleet of British ships to arrive in New South Wales. 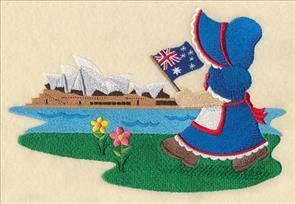 Maria requested Sunbonnet Sue and Fisherman Fred, in an Aussie style. Thank you, Maria, for your suggestion! 7.79" x 5.26" and 6.87" x 4.64"